This is sponsored content from BlogHer and Swanson. Should the stuffing be in the bird, or should it be baked separately on the side? That’s the big question. The great stuffing debate at Swanson is where we can vote about this question plus others concerning the stuffing, or should I say dressing? When it’s on the side, it is referred to as dressing. My father liked it in the bird, but my mom wanted it on the side, so they took turns. One year it would be in the bird, and the following year it would be on the side. My mom didn’t like the stuffing in the bird because she said it made the stuffing taste gamy and the bird dry, because you have to cook the bird longer to get the stuffing up to temperature. Instead, she stuffed the bird with chopped potatoes and onions, apples, or oranges. My Dad preferred the bird was stuffed because he said that was the more traditional thing to do. He was a strong believer in following traditions, and never understood why mom would want to dirty an additional dish just to make the dressing on the side. Now, I always make the dressing on the side. I also feel that cooking the stuffing in the bird makes the bird dry and the stuffing taste gamy. I stuff my turkey with apples, oranges, or fresh herbs. My favorite way is to stuff the turkey with lots of fresh herbs and butter. Then I will pour pinot grigio wine into the cavity and around the bird and bake it in a baking bag. Over the years I have tried just about every add-in to make different dressing variations. There is much debate in different families on what should be included or excluded from the stuffing. Cranberries and apples are a recent add-in that I have fallen in love with. I love to add them to a cornbread dressing like I have done in the recipe below. Bacon is an addition I don’t think anyone could disagree with unless your a vegetarian. Bacon makes everything better. Sausage and mushrooms are a favorite addition to my mom’s traditional dressing recipe, which I have also done in the other recipe below. Celery and onions are a classic combination that I just can’t leave out of any of my dressing recipes. Fresh herbs and spices are another addition that I have to add because they make everything taste so much better. Butter is an add-in my mom always used, and that I also add to all my dressing recipes. However, oysters are the only add-in that my family definitely passes on. We prefer our oysters on the half shell, fried, steamed or in a stew, but we’ll pass on adding them to the dressing. The biggest question, after determining if you should have stuffing in the bird, or dressing on the side though is whether to have traditional or cornbread dressing. This was a huge debate in our home, because my mom and my older sister always disagreed on the stuffing. Mom liked traditional dressing, made with Pepperidge Farm® Herb Seasoned Stuffing, and my sister insisted on cornbread dressing. Every Thanksgiving that I can remember, when my sister was visiting, we always had both. Mom couldn’t stand my sister’s cornbread dressing. She said cornbread was to be eaten as bread, and never put in the dressing. My sister hated my mom’s moist traditional stuffing. She said it was too moist, and had a general despise for it. For our family now, we make dressing with both traditional stuffing mix and cornbread stuffing mix. For the purposes of the Eclectic Recipes Great Stuffing Debate, I have made a recipe for traditional stuffing with added mushrooms and sausage very similar to my mother’s recipe from Swanson’s broth, and my own recipe for Cranberry Apple Cornbread dressing, a recipe that will surely impress my sister. Heat the broth, black pepper, celery, and onion in a 3-quart saucepan over medium-high heat to a boil. Reduce the heat to low. Cover and cook for 5 minutes or until the vegetables are tender. Remove the saucepan from the heat. Add the stuffing, sausage and mushrooms. Mix lightly. Spoon the stuffing mixture into a greased 3-quart shallow baking dish. Cover the baking dish. Bake at 350°F. for 30 minutes or until the stuffing mixture is hot. Recipe Note: you can also use a 3-quart casserole for this recipe. Alternate Preparation: for crunchier stuffing, bake the stuffing uncovered. Flavor Variation: For traditional stuffing, omit the sausage and mushrooms. Flavor Variation: for Cranberry & Pecan Stuffing, stir 1/2 cup each dried cranberries and chopped pecans into the stuffing mixture before baking, and omit the mushrooms and sausage. Add celery, onion, apples, cranberries poultry seasoning, and flat leaf parsley to a large bowl. Mix well. Add cornbread stuffing, butter and broth. Mix lightly. For a $1 off coupon for a 26 oz carton of Swanson Chicken Stock click here. When you visit, just watch the video, it is a hilarious video about a family’s stuffing debate. Then share the video with friends to get your coupon. So here’s the question for a chance to win a $500 Visa card from Swanson broth, cornbread or traditional? And should it be stuffing in the bird, or dressing on the side? Please tell me about your family’s stuffing debate in the comment section below. What are your favorite add-ins? What add-ins should always be excluded? There are also 3 more bloggers participating in Swanson’s Great Stuffing Debate. For three more chances to win, be sure to visit the BlogHer.com exclusive offers page and enter those giveaways too. My boyfriend and I always argue about how much stuffing to make. We found an awesome sausage+apple stuffing and a delicious cornbread one, along with the more traditional one. He always insists on making at least 3 large family-sized containers of stuffing (one each). The worst part? There’s only two of us! It’s always delicious, but there’s a point when you’ve made too much stuffing! we always used StoveTop and called it good…those giblet thingys grossed me out! Traditional all the way! And, in a pan, not in the bird. I like the crusty edges. On the side (since my husband is deathly allergic to poultry and wouldn’t get any)! Either one or variations would work for us! Thanks for a chance to win! We do both, we mix half cornbread and have regular stuffing, and we actually make a batch in the bird and out. Everyone should be happy at Thanksgiving!!! I love them both for different reasons. We do make a cornbread casserole too, which is really just another name for stuffing, and it is AMAZING! Stuffing tastes better cooked inside the bird but is much easier to serve to vegetarian friends if cooked separately (which also means that although I like sausage in my stuffing, I’ve resorted to vegetarian faux sausage on occasion). Apples, raisins, and nuts are mandatory. Celery is evil. I prefer a mix of rye and sourdough bread but intend to try cornbread with oysters one of these days. The stuffing in our house is traditional. The dressing should not be inside the bird (just for health issues). Okay I don’t like stuffing or dressing really at all. I’ve only had the “traditional” version though I think. So seeing as I like corn bread A LOT I would maybe like that better. Not in the bird though. Gross. And I’m not a fan of fruit with things… so I’d just say fresh herbs as an add-in. There’s no debate at my house; we all love my mom’s stuffing. Traditional, with onions, celery, butter, and sage. Inside is best, but she makes some outside, too, so there will be enough. The cornbread sounds good, but I always enjoy the traditional. We usually put some in the bird and some on the side – I prefer it on the side better, but my dad has to have it from the turkey! I have to have onions and celery in my dressing – but I don’t want any cranberries in it! There is not much of a debate here at our house over dinner, my husband loves everything I make he prefers traditional but he doesnt like cornbread, I like to make mine seperate from the turkey then use some turkey juice to keep it moist. Always have to have the onions and celery with broth. I don’t really do stuffing. My mom has a special recipe that everyone else loves though. it’s def. a necessity. I think switching things up would always be fun. We go with traditional typically since we have an old family recipe that some insist must be made, and we always do half in the bird and half on the side, but that is largely because there are too many of us and there wouldn’t be enough if it was all in the bird. My mother does experiment with this traditional stuffing though. Typically it is made with raisins and apples, but lately she has tried adding nuts and cranberries. There can not be any celery in it though, as I can NOT stand celery. I like traditional dressing — on the side 🙂 *Thanks* for the giveaway! Between my mom and I the BIG debate is if you should stuff the bird or not. She loves to stuff, I love to bake in a cupcake pan so there’s lots of the crunchy pieces my hubby and I like. Dressing on the side (: My family has debates over who does the dishes! LOL! Dressing on the side, definitely. In fact, it has it’s own ancient black cast iron pot in which it is cooked. Made with the meat from an entire chicken, massive amounts of cornbread, and Swanson’s broth. Never cranberries or apples! Onions, celery, & pecans in the dressing/stuffing for sure. Lots of Swansons broth! We put some into the bird and bake some outside the bird also–best of both worlds. We always have stuffing outside the bird. My grandma actually shapes the stuffing into small sized balls and bakes them so that everyone gets a crunchy outside coating to the stuffing. My husband was so confused the first time he came to holiday dinner and was asked how many dressing balls he wanted with his turkey. But we love it, especially warmed up with other leftovers the next day! We’ve always made the cornbread stuffing on the side. Our stuffing always has sausage in it. It’s traditional stuffing all the way in my family. We actually call it dressing…and it is always on the side. It usually has bits of eggs, herbs, celery, and sausage. So good. Cornbread all the way! and Crusty! Our debate is about cranberry jelly in a can – I just cant do it! I like some veggies and fresh herbs in my stuffing. Too much fruit can make it less savory. We like cornbread stuffing on the side! Sometimes we have the stuffing and no turkey! We all like stuffing in the bird and out of the bird so we have both. I love sausage and onions in my stuffing. I can do without nuts and apple. Dressing on the side. I have been a vegetarian since I was a kid, and my very understanding Papaw, who did the cooking, always made a veggie version for me and turkey-laden version for all else. And everyone was happy! I prefer very traditional stuffing and fortunately I’m always invited to dinner someplace so I don’t have to cook. Oh my…I am so going to try the Swanson’s Moist and Savory Sausage and Mushroom Dressing. It sounds so great. We usually just do the stove top(chicken) and the only thing I add is a little extra onion and pepper for more of a taste. I always have stuffing on the side but I am going to try the recipe above because my hubby doesn’t really like regular stuffing and I really think he will enjoy this one. Definitely traditional and in the bird. I like adding the giblets. My husband would have a fit if I made anything but traditional stuffing. I rarely put it in the turkey any more. If I do I generally put it in a glass serving dish and put it back in the oven to dry out while we carve the turkey. I like it a little bit crispy on top. My family does cornbread stuff, both in and out of the bird. They stuff the bird with what they can and then they put the rest in a casserole dish and bake it alone. I like traditional and in the bird so it is extra moist! We all prefer traditional stuffing.and I definetly think it should be cooked in the bird and on the side. We love stuffing so we make alot of it and you can only fit so much inside the bird. I also think giblets should be added and excluded at the same time. It just doesn’t taste right without them but I definetly will NOT eat them and pick it all out. Definitely traditional and it must have celery and our debate is whether it’s better on T day or the day after! I always vote for the day after! Oyster stuffing is my favorite but no one in my family will eat it! The cranberry stuffing looks fantastic. cornbread – stuffing on the side so people who don’t eat meat will still eat it — and we add lots of cranberries. I think the pumpkin pie could be excluded — too many calories already! We always eat cornbread dressing on the side. I don’t know what to add but I can tell you for sure what shouldn’t be added. My mom has ALWAYS put gizzards in the dressing. GAG. Sorry mom. I just started to love stuffing so I’m a pretty simple girl. I like it traditional and on the side, but now I’m convinced it needs bacon too. Thanks for the giveaway! My late husband used to always make a traditional stuffing (both in the bird and out) with sausage, raisins, and celery. It was supposedly a “family secret” passed down by his dad, but I never learned how to make it and he didn’t write it down. 🙁 I haven’t attempted to make it since he died. We are into tradition. Stuff the bird big! Mom’s own recipe, croutons, onions, seasoning, celery, etc. Wouldn’t have it any other way. Love it! We ALWAYS had the bird stuffed as a kid, but also had a TON on the side because there was NOT a turkey on God’s green Earth big enough to hold stuffing for my parents AND 9 kids…plus any “stray”s we might invite in. After the controversy about IF stuffing was safe to “BIRD”, we opted to always put into a huge roaster now. our family has grown to my mom, 9 kids and spouses, 23 grandkids and some with spouses, 8 great grandkids, and of course ALWAYs afew strays that cant resist my mom’s stuffing. She never uses a recipe and I always try to duplicate, but cant. She/We put TONS of giblets in but if my kids knew what they were they would totally FREAK! Always add some slow cooked chicken breasts and legs to cut tiny and make it nice and meat. No fancy cranberries or Walnuts or Pecans…not for us. We like “old school” stuffing! Always with Swanson broth! thanks so much…am getting hungry thinking about the best part of thanksgiving meal! We make 2 kinds of stuffing/dressing every year and neither one of them is traditional. One is my mother in laws recipe which is a very moist bread stuffing made with peaches, onions, olives and just about everything but the kitchen sink in it and this one is the families overall favorite. The other stuffing is my mothers recipe which is a rice stuffing with pine nuts in it which is also a big hit. This year, I’d like to try making a new recipe such as the Sausage and Walnut recipe as it sounds like a recipe that most in our family would enjoy. However, that would be 3 stuffings/dressings to be made, because the family will definitely be game to try out the new recipe, they will still expect to eat the others normally served too. As far as the stuffing v. dressing debate, we do both. I personally prefer the stuffing cooked inside the Turkey. I like tradition cornbread dressing.. My family also likes it.. I definitely cook cornbread dressing outside of the bird with celery and onions and of course butter!! It must contain sausage and lots of sage! I prefer keeping all stuffing out of the bird and in a casserole dish on the side. I don’t want to have to over cook the bird to ensure the stuffing is done. I prefer cornbread dressing and if traditional means those brick like things they call stuffing, then count me out! I also always cook my cornbread dressing rather than stuffing it in the bird. My family likes it that way. 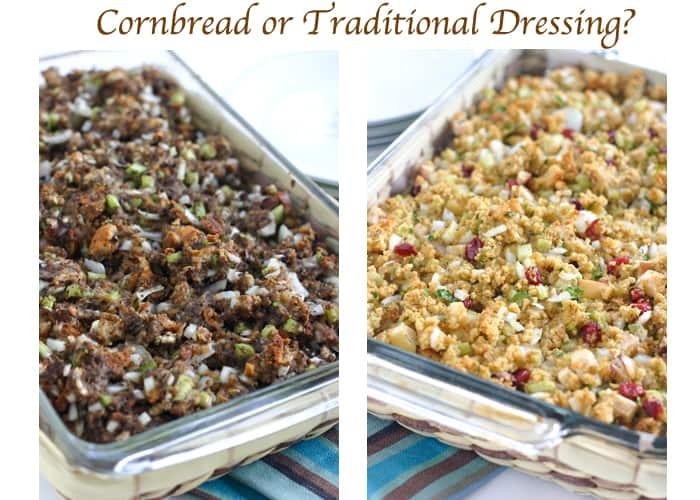 we love some cornbread dressing…traditional all the way! I prefer traditional stuffing from the bird, but it does gross me out a bit. I just can’t watch it come out of the bird! Cornbread, on the side, no other option! I prefer traditional sage stuffing, stuffed inside the bird. However, two of our guests are vegetarians, so I make it on the side so it isn’t mixed with the turkey juices. I think the only debate we’ve had was when I wanted to add raisins to the stuffing, and my kids vetoed the idea. OUr big debate is what kind of stuffing to use. I love cornbread in mine but my brother loves loads of cranberries. My sister is indifferent. So my mom always makes a little cornbread stuffing on the side but these days I assist her! We do love roasted vegetable stuffing though so that’s always a winner! 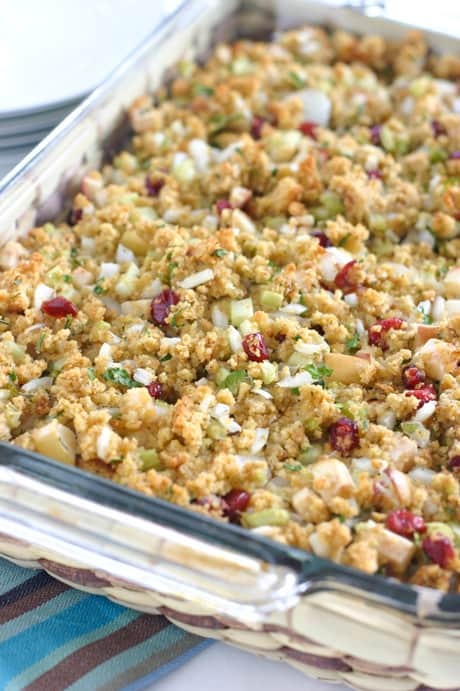 I love sausage and cranberries and apples… and we make a dressing that combines cornbread and the bread crumbs.. YUMMY! On the side, cornbread, and cranberries! Yum. Cornbread dressing all the way! Pepperidge Farms Herb Stuffing, and I add toast (torn in pieces). Nothing fancy – just simple but soooo good! Oh — I forgot- we use Swanson broth for our stuffing. It’s a must! Our family prefers traditional stuffing in the bird but outside of that the debate rages as to whether the stuffing should be plain or contain fruit and veggies so we rotate each year stuffing the bird with one kind and having the other on the side. I always do homemade dressing on the side. Nothing extra added because my children will not eat it. I’ll side with Alton Brown on that one… Stuffing on the side! It doesn’t get hot enough to kill any bacteria from the juices that have run into it! while not man (if any) have died this way, I don’t want to eat raw turkey juice! I love corn bread, never tried it in dressing, but I am invited out this year. We do both in the bird and to the side. It’s not really been a big debate in our household thus far probably because we’re still creating our Thanksgvings( finding out what we like and don’t like homemade) and for a large portion of them we’ve used the box stuff(that is when there wasn’t a deployment). This year I’m trying to make homemade dinner rolls but I’ve been scoping stuffing recipes. The cranberry apple dressing looks pretty good. My mom has made her stuffing in a few different ways in the past but they have never come out as good as the traditional. There is just something about high fiber bread that has nuts and berries in it that just makes the stuffing taste nasty. Using simple white bread is the best way to go for me. I do enjoy my moms stuffing when she puts in apples, cranberries and raisins. I think that is because they all mix together so nicely. And the stuffing must go in the bird. There is just something about the added flavor from the bird that makes my heart jump with joy. And nothing else except for the above should be added. No vegetables, and certainly not oysters. Oh yuck! lol This is basically what most of the family enjoys: White Bread, cooked onions, celery, Bell Seasoning, melted butter, whole cranberries, diced apples, whole raisins. That mixture makes for a yummy traditional stuffing. The big debate in our family is stuffing….or no stuffing. I personally don’t like stuffing, but my husband LOVES it….so I’ve learned to make whatever he likes. And this year I think I might try to sausage and mushroom version on Swanson’s debate site…it looks good, even to me! We like traditional stuffing on the side of the bird. However our extended family likes oyster stuffing so usually we make both. We make it with cornbread and pepperidge farms bread crumbs and call it dressing, of course it’s all on the outside! on the side, definitely, although i can enjoy both traditional and unique versions. i love the idea of adding cranberries–that sweet, tangy chew would be a great touch! Our debate is whether to stuff the turkey or make it on the side. Hubby’s family does separate stuffing, I cook it inside. It is so much better than making it on the side. Last year we had out of the bird stuffing at hubby’s family and it didn’t compare to mine! I LOVE cornbread dressing! yum! I also do NOT like the dressing inside of the bird-I’m weird about germs, etc. lol, and have heard too many say DO NOT do it!! I also can’t stand giblets in the gravy or the dressing-yuck! ha..Boiled egg is always a must in mine! We are Cornbread stuffing eaters all the way through…which is good cause I have NO idea how to make it any other way. Creatures of habit!! Thanks for this great chance!! I think both traditional and cornbread are equally delicious. If we’ve got company of more traditional tastes, we go with the usual herb, spices, and breadcrumbs-but when we have people that are willing to try new things we always introduce them to the cornbread stuffing! We all love garden veggie stuffing and no on think sausage should be in stuffing. My first entry is #28. My mother in law loves to put sweet things in the stuffing, like cranberries, oranges and apples–I’m a savory kind of gal–though not as much as my giblet loving grandma. I love cornbread and sausage stuffing, but my family would prefer that I make “regular” stuffing once in a while. I guess I should say dressing since I don’t stuff the bird. And no matter what kind of stuffing or dressing we make, it will NEVER include oysters. Cornbread, definitely. It should be oozing with butter, sausage and herbs. On the side (the left side). Okay, just kidding about that last part. I did see pecans in a Swanson recipe on the debate site. I’m going to add that this year. It sounds good. Only thing I saw that I thought should be excluded is pears. For me…that just doesn’t seem like it fits. But I could be wrong…. Our family does traditional dressing on the side. The big debate is all about SAGE & finding the right balance of this potent spice. I personally would love to dress it up a bit with pecans or cranberries. My suggestions never go far & mom’s recipe remains pure. We love having cornbread stuffing, but I like to add some type of meat. My family,however, doesn’t like anything in their stuffing. Cornbread dressing on the side is the ultimate winner in my book! I’m for stuffing but hubby doesn’t agree. Dressing on the side or not, endless debate every single year. We love stuffing on the side,never tried the cornbread one or mushroom one ,maybe this year. Cornbread, the simple kind…we don’t tend to add a lot to it. I usually make it as a side dish instead of in the turkey. Though I did see the recipe for the Smoked bacon and portobello mushrooms stuffing and might have to try that this year. My family and I like the stuffing inside the turkey, which accountf a really yummy stuffing unfused with all the meat drippings. I suppose it is because I am born and raised in the South that we have always had cornbread dressing as a side dish. We never made stuffing. After seeing so many stuffing recipes, I think I would like to make sausage stuffing. But I know for a fact that my family would never approve of replacing dressing with stuffing. Maybe I’ll make a small pan for me! My mother-in-law loves her stuffing from a box and I like mine from scratch. I defer to her, until she can not cook anymore. I would love to add apples and cranberries to mine. Traditional stuffing on the side…..LOVE it! Our stuffing debate is whether it should have croutons, or dried bread. We like it moist, not dry. Also, should you cook it in the turkey or outside. I think added vegetables to it wouldn’t be tasty, but my mother in law makes the best pineapple stuffing. We always unstuff the bird but we have two stuffings…one plain cornbread and the other is my mom’s secret recipe and it has onions in it. We have to have two because my brother hates onions and he’s the only one that eats the cornbread. I’m not opposed to add-ins though and that Sausage Walnut stuffing from Swanson sounds yummy. Maybe it’s time for a change…. I prefer dressing on the side, because I like the turkey to have herbs roasted inside it. As far as what additions to it…I love cranberry added…no one else in my family agrees though! The one thing to omit is OYSTERS…especially for me…I’m allergic! We grew up with traditional bread stuffing, cooked inside the bird. But now, I’m vegetarian so we do a bread stuffing, without any meat products, and stuff inside a Seitan loaf. Yum! We make a couple different batches of stuffing. My inlaws like innards (ha) in their stuffing, like giblets, organ meat, which I find unappetizing. I like it plain, without a lot of spices. My kids like sweet stuffing, like apple and berries stuffing. We make sure everyone leaves the table happy! We like to mix our cornbread dressing (stuffing) with the Turkey (turkey in center & dressing (stuffing) surrounding it. I like to add in celery, onions, and sage gives the corn bread dressing a wonderful aroma and flavor. We never really stuff the bird, we like our “stuffing” or dressing in this case, on the side. I find that it keeps the stuffing from being too mushy. We love celery carrots mushrooms and just about anything else we can cram inside the yummy stuffing. It’s my favorite sidedish on the holidays, it’s always a big people pleaser. Seriously, who *doesn’t* like stuffing? 🙂 Thanks! I prefer dressing on the side, and I love it with mushrooms! Cornbread on the side…no weird fruits or meats or nuts added, it has to be the traditional stuff. My mom tried a new recipe almost every Thanksgiving growing up often with hit and miss results. My Mother in law has the perfect recipe…I think it’s the one my Mom was searching for all those years. Very basic, but tasty! Dressing on the side, regular bread, with sausage, celery and sage. I’m not a huge fan, but the rest of my family loves it. We go with traditional bread stuffing, not inside the bird, usually filled with onions, celery, chicken broth and sausage. We love traditional. Outside the bird. Our add in is Swanson broth, onions, celery, thyme and saugage. Best part of thanksgiving is the stuffing! No raisens should be put in stuffing. Complete turn off for me. Our house is a traditional dressing kind of house. We don’t cook it in the bird. My favorite add in is raisins. Any kind of seafood in the dressing is a huge no-no. We are traditional stuffing people and I make it in the crockpot. Helps free me up. Our debate is whether to go through the work or get Stove Top that the kids will eat (homemade always wins out). Mushrooms are always left out. Traditional is the vote at our house…it’s what the guys insist on. We don’t stuff the turkey…the “dressing” is baked in the oven and served as a side dish. We use traditional ingredients and nothing really exotic. We are a traditional bread household. But after reading about cornbread stuffing, I think we might give it a try! I like my stuffing as a side dish and I make it with bread crumbs. I’ll add onions, celery, and various spices as well as broth. Mushrooms would be excluded. Our Thanksgiving debates usually consist of political debates. We have cornbread dressing on the side and lots of it. I personally hate traditional stuffing….I don’t do onions, and childhood memories of dry, oniony bread make me want to gag,lol…I tend to go a more unconventional route, and add chorizo, cheeses, jalapenos, and pretty much anything that makes stuffing well….less stuffingy! I’ll go with traditional stuffing, I put some stuffing in the bird and always make another pan to cook along side to have extra for leftovers, I dont use sage in my stuffing because we dont like that flavor, but I add the cooked liver and lots of celery, onions, finely crushed breadcrumbs, eggs, parsley and garlic, chicken broth and melted butter, so far my stuffing has always been a hit at our house and since I’ve been making it the same way for 30 yrs now I probably wont change it. For me, it is traditional cooked inside the bird. I personally don’t think fruit should be in stuffing. Coming from New England, it’s traditional stuffing all the way. My mother used to make it in the bird, but my soon to be mother in law cooks it on the side…and I can’t tell the difference. So, on the side because less risk of health contaminations yadda yadda. Who cares so long as it’s moist and drenched in gravy?! We like cornbread stuffng w/ mushrooms and sausage. My family is on the cornbread dressing side of the debate.. outside the bird. It is stuffing in the bird and some on the side. We like traditional and cornbread. Add chicken broth, celery, onions and black pepper to the traditional. Traditional stuffing on the side for our family. My preference is cornbread stuffing, on the side. I also like to add apples and chicken broth. My family is usually willing to eat my stuffing experiments, as long as there are no nuts in it. We all agree……it’s cornbread dressing all the way!!! I love this holiday just for the turkey and dressing! 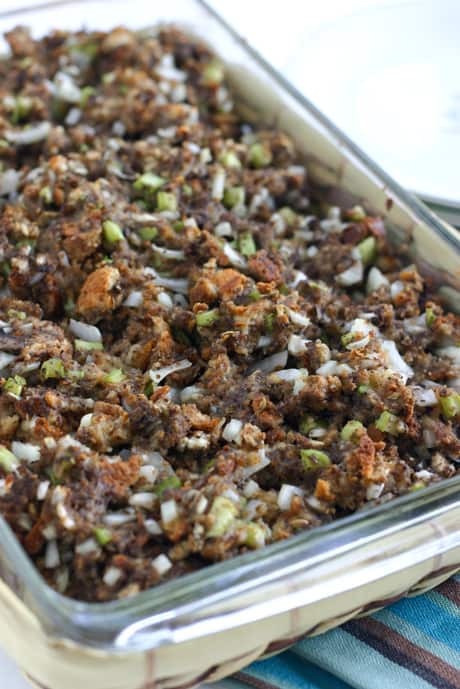 Stuffing should be made with bread, stuffed inside the turkey and made with turkey drippings! Our biggest debate is keeping the nuts out of the stuffing, I hate it but my husband loves it. He usually wins that fight. We stuff in the turkey, always referred to as stuffing not dressing. we use traditional ingredients, we do not include nuts or fruits or anything like that. Both. I love love love any kind of stuffing its by favorite part of the meal. I’ve always had stuffing inside the bird. My Mom made traditional and I never ate it growing up. It was like a mouthful of pasty celery. Then – I met my husband and his mother makes the best stuffing I’ve ever had. It’s cornbread and there are water chestnuts and olives and all kinds of crazy stuff… I hope to squeeze the recipe out of her this year! Great giveaway, Angie! Thank you! But, I have to say your addition of cranberries and apples sounds so, so good! Since I was a little girl, I’ve been waking up early to make my grandmother’s traditional dressing alongside her, cooked on the side but moistened with plenty of turkey juice along with the Swanson broth. It’s simple, no fancy add-ons like cranberries or oysters, but I maintain that it’s the best dressing in the whole wide world. I’d go for traditional, out of the bird. I like the traditional stuffing cooked seperately outside the bird. I like to stuff the bird with onions and apples cut up it keeps the turkey moist and flavorful. for add ins i put onions, celery, cranberries. I like traditional stuffing…straight from the box!! Stove Top all the way! I prefer my mom’s stuffing made with bread and giblets. In the bird of course. However, my husband and kids won’t touch the giblets, so I make my own version using bread and sausage. I still stuff the bird thought. I like tradtional stuffing-in the bird (it is called stuffing!) Leave the turkey innards out-I like celery, walnuts (or pecans), onion, butter, and chicken broth. Thanks! We always have traditional stuffing, but I would actually prefer to have the cornbread stuffing. We always have it on the side (we started this years ago when there was a great to-do about possible salmonella contamination for putting stuffing in an uncooked bird. Even though we make it on the side, we still call it stuffing in our house. I like to add in some dried cranberries. I really think the possibilities are endless for add-ins and that it is up to each family to create their perfect stuffing/dressing. My Mom always put stuffing inside the bird, it was the best stuffing. My Mother is now deceased. I always fix it as a dressing, never in the turkey. I use cornbread, shredded chicken, celery, sweet onions, herbs, spices, and Swanson’s chicken broth. I dread the holidays this year because we have to go to my husband’s family and his grandmother will not let anyone bring anything. Her dressing is straight from the box with no extras. Yuck. Our main debate is the stuffing itself. Some think it’s the best part of the dinner and some won’t touch it. We like traditional stuffing with lots of celery and onions. Sometimes we add mushrooms or wild rice. We have DRESSING made with cornbread. We don’t add much to it–some onions and celery cooking with a few herbs and spices, and we use some chicken stock (it has more flavor than broth). Mmmm, I can’t wait! I don’t have any favorite add ins but I think celery needs to be banned from the world of stuffing! Stuff the bird with stove top stuffing. No big extra veggies in the stuffing. Stuffing is my favorite side dish of the Thanksgiving dinner. I love cornbread stuffing with apples and onions! I personally don’t like stuffing cooked in the bird so I always make it in a casserole. One thing I don’t care for in stuffing is chestnuts. I like any kind of stuffing, traditional, cornbread, most anything. But I don’t like mushrooms in it and I definitely like it cooked seperate from the bird! The thought of cooking it in the bird just grosses me out and makes me lose my appetite. I always like nuts and cranberries stirred in. Well, we don’t ever put the stuffing in the bird, and we’re a simple family who just makes boxed stuffing! *hangs head in shame* However, THIS year, my brother is making some fancy stuffing (or dressing, I guess, since it won’t be stuffed anywhere!) so I’m excited to branch out a little! Ooo, I think that oysters should ALWAYS be left OUT of the stuffing…or anything, for that matter! It should always be cornbread stuffing on the side! You may “jazz” it how you like but cornbread and on the side. In the bird. But the debate: Add two eggs to the stuffing, OR Don’t add the eggs. OR Cook the eggs first, OR add uncooked? We usually cook our stuffing separately. Actually my husband is not a giant stuffing fan but I love it. Especially with pecans and golden raisins! I am not crazy about too much sage in stuffing. I like traditional stuffing. I guess the proper word would be dressing because I like it baked in its own buttered casserole dish to develop a crusty top, not inside a bird getting all gummy. No seafood, like oysters, in it ever please! Stuffing should be traditional and served on the side I think. Growing up my mom always made traditional stuffing inside the turkey. I hated stuffing! However, my taste buds have matured as I have and now I do love traditional stuffing. I have yet to make it, since I haven’t hosted a thanksgiving yet, but I would probably not make it inside the turkey, simply because I have a “touching poultry” phobia. I prefer cornbread stuffing. I also prefer it to be stuffed in the bird. We have cornbread dressing outside of the bird. I prefer it with no meat or nuts. I make cornbread stuffing, and always add in celery! We prefer cornbread stuffing on the side. My answer to win the GC is … traditional! But I do have to add that I also love cornbread. I just think that traditional stuffing is great with anything and that cornbread tastes better with certain dishes, IMHO. And definitely in the bird with celery.Thanks! Well, we stuff that bird with traditional stuffing..celery, onion, good bread cubes and Swanson’s broth on top. My dad, rest his soul, used to put everything but the kitchen sink in his stuffing. He thought it was great…none of us kids would touch it. So give me plain, simple and delicious. Tweeted ya’ this fine wet morning.. I definitely enjoy (traditional) stuffing better as a side dish. I love eating it! I’m a traditionalist – stuffing goes in the bird. But, I wouldn’t be opposed to having a second stuffing on the side with all these great recipes to try!! How about both? Make twice as much and put half in the bird and half in a dish! The stuffing goes in the bird, of course. That’s why it’s called ‘stuff-ing’. I usually put some stuffing in the bird and then put the rest in a crock pot. I hate dry stuffing and the crockpot keeps it nice & moist! Ever since I can remember my Mom has always used bread, assorted vegetables and chicken broth all “STUFFED” into the Turkey for Thankgiving. And its so delicious we never have leftovers. We prefer traditional bread dressing on the side, with lots of onions, celery, and sage. Im not the greatest cook so I stove top stuffing one box for inside the turkey and a seperated one in a casserole dish! I use to stuff the bird but Salmonella scares me so it is now in a baking dish. I have always loved Cornbread dressing on the side. I love for it to bake with a crunchy top on it, just perfect for a serving of gravy over the top. We love cornbread stuffing, on the side, with no add-ins. Mushrooms are absolutely out. I’ve never thought about bacon. I might see if I can convince the family to give it a go this year. In general, we all agree on simple stuffing on the side. We don’t do stuffing anymore. We do Martha Stewart’s parsnip bread pudding. It is just yummy and after I made it last year, no one mentioned stuffing again. We always have traditional cornbread stuffing, outside of the turkey. We use fresh strips of chicken breasts,thinly diced onions, and top it with cream of chicken soup! I really prefer cornbread stuffing for Thanksgiving dinner. I make it in a separate pan by itself. My family does not debate about stuffing, they only stuff it in their faces. I pretty much just follow the recipe and don’t add anything extra to the stuffing. We use my mother’s recipe for a traditional stuffing–cooked inside the turkey. It never occurred to me that could make the turkey dry. I guess maybe we’ve been lucky. Cornbread (or a mixture of both) sounds good to me. I’d love to have apples and cranberries in the stuffing; and, I agree with you “Bacon makes everything better.” so maybe I’ll try that sometime. I would never put sausage or oysters in my stuffing/dressing! and, I go a little bit easy on the herbs & spices. Now I’m getting hungry. Glad I found your site. Thanks for the giveaway. Try Cream of Mushroom soup instead of the broth for stuffing. Awesome! We prefer traditional bread dressing, usually not in the bird. I follow my mother’s traditional stuffing recipe. Cubed bread, celery, onion, butter, a little milk and salt and pepper. Simple, but good – has to be in the turkey too! It’s cornbread dressing on the side for my family. I boild a whole chicken and shred into the dressing. It’s delicious! Traditional stuffing on the side and NO GIBLETS! The stuffing debate in our household is whether to serve it at all – I love to eat it but no one else does! Our debate is whether to put it in the turkey or in a separate dish. It creates a big discussion every year! I have grown up with the pilgrim way of things being born in America’s hometown, Plymouth, MA. We have a traditional stuffing with hamburg, Pepperidge Farm herb seasoned stuffing, and egg and onions. We make it like a meatloaf but just a speck drier and we always stuff the turkey. Top it with giblet gravy and yum. On the side, most definitely! And cranberries or apples must be included, to add a bit of sweetness! We’ve always made the stuffing outside of the turkey. I’ve only ever had traditional Stove Top stuffing (my in-laws and my parents are not very adventurous eaters), but would love to try cornbread stuffing some time! In our family we LOVE the giblets! We definitely like our stuffing outside the bird and my very favorite is sausage and mushroom stuffing using swanson broth of course! Yummy! Traditional dressing in the bird with vegetables but no fruit, or nuts. Our biggest debate is not about the dressing: it’s about the cranberries—should they be served whole and hot or cold and jellied! I cook the dressing on the side so the turkey cooks faster. I would love to find a great recipe with apples. I think it would be so moist. Thanks. My mom used to put stuffing in the bird for a while but over the past few years, we’ve put it as a side dish. I also heard Alton Brown on the Food Network talk about how in order to thoroughly cook your stuffing it must get to a certain temperature and in order to get to that temperature, the turkey must be at least 200 degrees and by then.. yikes. Cranberry Apple Cornbread Dressing! Yum! I wanna try it! This is probably the first time we’ll be undertaking stuffing this year (before we moved here, we never celebrated thanksgiving), so we will try both versions and see which one our family will like best! My favorite stuffing is cornbread stuffing. It should be on the side without celery. Stuffing should be served on the side for food safety reasons ( I have always heard). It should be made in the traditional way with seasoned bread cubes, celery, onion, broth, and secret ingredients. My mother always followed a Blue Ribbon recipe (I think…) that used sauteed celery and onions and then milk as the liquid, which resulted in a very moist and delicious stuffing. It can go in the turkey, but I prefer it on the side. “Poultry seasoning” was the only add in, from what I can recall, but it was very simple and delicious. ps-I am Canadian, so our Thanksgiving is long past (ours is a harvest moon sort of celebration, and our harvest is a lot earlier than yours! ), but we still get excited for yours–just reading all the blog posts prompted me to plan another turkey for this weekend! I like traditional in the bird stuffing. What ever my mother in law does to her stuffing that’s how I like it. we always try on that’s something different and one standby from Betty Crocker…Betty’s always win! In my family it’s ALWAYS been on the side, but besides that it changes from year to year. I guess because we haven’t yet found one perfect dressing recipe to stick to, our tradition is to try out a new dressing recipe every year. I prefer traditional stuffing in the bird – with only a little butter, onion and herbs. We like Stove Top – on the side (never IN the bird). We keep it simple – rarely adding anything because we have too many picky eaters! I always cook traditional stuffing and never put it in the bird. It seems to either be to dry or not cooked enough if I add it to the turkey! I love stuffing of any kind, but especially with cranberries and pecans. YUM. A traditional stuffing inside the bird. We put raisins in, but never ever any kind of nut (or oyster!). We always make 2 different stuffings- one is traditional on the side. The other kind is always up for debate- usually cornbread or a sausage stuffing. We like nuts in it but never mushrooms! The debate around here is whether or not to put celery in the stuffing. Some people in the family love it, and some hate it. We have to make 2 different kinds. I like fixing the dressing on the side. Apples and sausage are a couple ingredients I put in there. My sister always bakes the stuffing in a pan, never in the turkey. I’ve heard that that’s not safe. We have just plain stufing. I’ve seen some with apples so I’m thinking I may have to try that. It sounds really good. thanks for the giveaway! veggies and bread for us! We like the traditional stuffing, on the side. We have never added anything to our stuffing, we like to keep it simple. Our favorite dressing is made with dried white bread, butter, celery, onions, salt, pepper, sage, poultry seasoning and turkey or chicken broth. No oyters, mushrooms or giblets. Baked outside of the turkey or chicken. We make LARGE amounts as we love it left over. chicken broth, turkey drippings or water? chicken broth to start, I baste in part-way through with turkey drippings, finish with melted butter to crisp up the top. stuffed or on the side? dressing, in a separate casserole dish. We like traditional stuffing in the bird, made with chicken broth, celery, onions, and bits of turkey. No sausage in our house! I like both traditional and cornbread and it should always be stuffing in the bird no family debates everyone likes my stuffing sage is a must have ingredient. oyster are a big no no. we like cornbread dressing cooked on the side. add ins include celery, onions, and herbs.. we don’t really add anything else although we usually have to have cranberry sauce, brown gravy and giblets on the side to cover everybodys various taste.. i personally like mine plain, with nothing on top of it. Without a doubt…the dressing. My family prefers my grandmother’s traditional stuffing recipe (which is great, but very time-consuming and a bit boring after all these years). I, of course, want to spice things up. No debate here. Dressing is on the side and traditional. Nothing crazy or fancy in it such as nuts or unheard of fruits/veggies. would you believe our biggest debate is stuffing made in the bird or not? I like it in in-laws don’t. I’ve lured husband to my side of the debate because he loves my stuffing. I have never met a stuffing that I’ve liked, so I think that stuffing in general should be excluded from the table. Most people seem to like it, so I guess I’m in the minority. A lot depends on my mood at the time, sometimes cornbread, sometimes not; sometimes giblets, sometimes not; I like to eat the stuffing that is is the bird first. I’m also game to try other variations as long as someone else cooks it. My preferred version has day old cornbread, onions (pureed), celery (very finely diced), butter, Swanson’s broth, herbs & seasoning and it would be cooked OUTSIDE the bird. We argue about this in my family also. My mom makes dressing with all of the above plus carrots, but she likes it cooked IN the bird. My sister likes to be adventurous and add fruits, nuts and sausage. I can eat it either way, but never make anything but the quick & easy version listed above when I have to cook it myself. I think that Cranberry CornBread stuffing looks excellent! I think it’s safer to make stuffing outside the bird, why take chances?? I usually like any stuffing with nuts and sausage, but I don’t like oysters or any kind of seafood! Nice picture of you here!!! All of it sounds sooo good! I guess the oysters would be great! Traditional in our house. The debate is whether to cook it in the bird or out, so I do it both ways to make everyone happy! I like the traditional stuffing and has to be outside not in. we love the traditional stuff like mash potatoes, Yams,gravey the good stuff. Great giveaway thank you. We like traditional, in the bird. Sausage is a must have! It’s GOT to be in the bird. It adds so much more flavor to the stuffing itself. I don’t add any crazy add-ons to it…but I DO make my own stuffing using fresh bread, celery, carrots, onions, broth, and poultry seasoning. It’s so good. My family prefers traditional and it should be stuffing in the bird. We don’t have any stuffing debates- my mom has a recipe that it used every Thanksgiving. I don’t have any opinions about what should/shouldn’t be in stuffing since I don’t really care for it to begin with. It has to be cornbread stuffing and I never put it inside the turkey. It’s always baked separately. Since I cook it, there is no stuffing debate here except that some don’t want onions in it, so I puree them and mix them in and they think it tastes great! We’ve always had dressing cooked on the side (I think, mainly because it is easier) and never made with cornbread. Personally I feel that cornbread is too sweet for a dressing. Now, just because we’ve always had a savory type traditional dressing doesn’t mean that we are dull (though, really we sort of are) sometimes we’ve used our own leftover bread and this or that food item added. Seeing the image of your savory stuffing I imagined using pumpernickel bread. Yum. I’m going to have to try that some time soon. I think it should be traditional and should be both, in the bird and extra pan of stuffing, thats how we do it at my home and I have been making stuffing for 30 yrs now with no complaints, I use bread crumbs, onions, celery, melted butter, broth, cooked turkey liver, parsley, seasonings and I always make the extra pan because whats in the bird is never enough, and no nuts, or fruit bits for us, we like our fruits in pies. For my family, the stuffing always has to be traditional cornbread stuffing and cooked in the bird. That’s the way my mother did it, and that’s the way I do it. We always argue about what goes in the dressing, we have different tastes for sure…but the question of in or out of the bird is easy. I make the dressing out of the bird and serve it piping hot with gravy. Yum! I prefer dressing on the side, preferably cornbread dressing. Things I don’t like in my dressing( ever 🙂 ), oysters, nuts, and crunchy veggies. I make a traditional stuffing similar to the one my mom made. Just bread, seasoning, onion, celery, butter and Swanson chicken broth. I usually put it in the turkey, but this year I made it in a separate pan. I had a larger bird and I felt safer doing this way. It turned out great. Traditional, on the side, and with fruit (apples and cranberries) and nuts!! Yum! I like a mixture of both regular bread croutons and cornbread. I saute sage sausage, onions and celery, then add in broth, melted butter and seasonings. I like my stuffing/dressing to have a crispy top, so I always bake it on the side. Our biggest debate is whether or not to make the meal at all! We go back and forth between making a vegetarianized traditional Thanksgiving meal and getting a huge yummy meal from Buca di Beppo to go to eat at home. This year we did the traditional and it was divine! I make our stuffing from scratch using organic ingredients that include veggie sausage crumbles and lots of sage and yeasty white bread! NO meat ever!! No bird, so stuffing is a side dish. We celebrate Thanksgiving just the two of us (my wife and I), so we don’t have the pressure of cooking for relatives or friends. That said, this freedom has caused us to never know from year to year what we are going to do for Thanksgiving dinner! Some years we go for Indian, some we get Italian, and others we have the full traditional Thanksgiving feast! Its always debated! Our only rule for the food is that it has to be vegetarian and not contain any of our many food allergies! I’m a traditional type of stuffing gal, but our big debate is whether to stuff the bird or not. So far I’ve won with dressing on the side! I only do cornbread dressing on the side.I love to add sausage to it.I will never put a fruit in my dressing.My husband always thought dressing came in a box but now that he is in the south he knows the difference.Thanks! For us it’s cornbread, on the side. The only real add ins are chopped turkey meat and sometimes boiled eggs. I would say cornbread stuffing and ON THE SIDE. I personally don’t like stuffing so I need to have the option of NOT having it in the rest of my food. I’ve never had cornbread stuffing, I’m quite happy with traditional thank you. We have always put it in the bird. It picks up flavor from the turkey juices and fats seeping in, plus it gives flavor to the meat from all the seasonings in the stuffing. Sort of a symbiotic relationship I guess. The only thing I say never belongs in stuffing is any sort of dried fruit or anything else that would impart a sweet flavor to the savory dish. Cornbread stuffing is a must. We always prepare it in a separate casserole and use some of the turkey juices to flavor the stuffing. Stuffing on the side always, and we agree it has to be a cornbread stuffing, I add sausage, and cubed chicken, as well as hard boiled eggs. Mom makes the cornbread dressing, and she always adds sausage, and chicken, some years she adds apple as well, whatever it always seems right for the occasion. Stuffing Debate??? You list some great sounding ones-All mine have flopped, so I end up making a commercial kind out of a box and it tasted so, so! My family prefers simple cornbread dressing (on the side), so that’s what I make. If we’re having guests, I also make traditional stuffing in the bird. Personally I think everyone who comes to the Thanksgiving dinner should bring a side of their own dressing speciality, so we could try a little bit of each. I like fruit and nut add-ins, but never meat of any kind. I love cornbread and sausage stuffing and I never make it in the bird always on the side. We are pretty simple people, Turkey flavored Stovetop stuffing on the side. We do both in the bird and on the side. With six kids and 12 grandkids, no bird could hold onto our stuffing requirements! I like celery in my stuffing but my cousin doesn’t…that’s really our only debate. It should be traditional and on the side. My mom likes to add sausage and it’s really good! My family likes cornbread stuffing, cooked on the side….and added in, hard boiled egg. I’m not sure why! We love traditional stuffing on the side with raisins and apples added. I think my family has always done dressing (on the side) instead of stuffing (in the bird). My aunt makes it with oysters! Our family enjoys a non traditional stuffing made with gluten free bread and zucchini! We do not ever do stuffing inside the bird, only outside because it is gross having it inside. Our favorite add-ins are: dried cranberries, zucchini, onion, carrots, celery seed, thyme, sage, black pepper, butter, broth and of course the gluten free bread cubes. We don’t think that celery should ever be allowed inside stuffing, no nuts either! I always make traditional bread stuffing and it goes inside the bird. My mom made awesome cornbread stuffing but I’ve never been able to make it as well as she did so I stopped trying. Maybe I’ll try your recipe. Mine is very simple, onions, celery and giblets with day old bread cubes and seasoned with sage and broth. We love traditional stuffing, in fact we like the Stovetop stuffing from a box the best! And we always serve it on the side. I’m recently married and it was just my wife and I for Thanksgiving this year so there were no debates over food! Traditional with half in the bird and half on the side. We all agree my mom makes awesome stuffing and none of us know exactly what she puts in it, she tends to fiddle the recipe a bit every year. I like traditional stuffing, with mushrooms and sausage outside the board. We have always made traditional, non cornbread stuffing, on the side. But with TONS of extras: onions, celery, raisins, apples, walnuts, mushrooms. You name it, we might throw it in there and I LOVE it like that! We almost always end up with traditional stuffing on the side. The Mother in Law takes charge of the stuffing. No debates. We always cook it outside. I like it crispy and in the bird it gets soggy and odd colored. We never add more than onions for a veggie-onions sauted in butter and we like it basic. I cook it on the side. My in laws swear that I am the only one who can cook the stuffing like there grandma used to. So I get volunteered to cook the stuffing every year! I usually prefer traditional over cornbread only recipes, always dressing on the side for me. I don’t like too many add ins, definitely not nuts because that’s not the texture I prefer in dressing. We don’t debate because everyone agrees that the family recipes are good. Always traditional and always on the side. I am not a fan of turkey so if it is in the bird I wont touch it. we do not stuff the bird,we do stuffing on the side pretty simple,but we all like it no debate here! I prefer traditional, not cornbread…and your mom had it right, not in the bird! I agree that it gives it a bad flavor and I prefer mine straight out of a dish! I think all good stuffing should have onions, mushrooms, and lots of seasoning…I think there should never be corn in stuffing, it’s disgusting to me! Cornbread stuffing all the way. Mom adds some breadcrumbs to it too! On the side, the stuffing is too moist when in the bird. We add in chicken pieces and sauteed onions and celery. Traditional stuffing, outside the bird with NO raisins. That is the only stuffing served in my home. I love cornbread, but my husband doesn’t. So I make traditional, but I add in apples and cranberries because I like them. I always bake it outside the bird, stuffing it seems like too much work. In my family, my grandmother always makes the turkey and dressing, with the dressing as a side dish. She makes homemade cornbread the day before and crumbles it for the dressing. It is delicious! The only add-in I would suggest is cranberries. We have cranberries on the side. my mom makes it, so I don’t know. I only make stovetop but I use chicken broth. We make our stuffing with chicken broth~celery and onions. My mom always makes two different stuffings because there is always a savory vs. sweet debate. We asbolutely always cook Stovetop….no other stuff in our stuffing! My family and I like traditional stuffing in the bird – bread, celery, onion, seasoning. traditional all the way and in bird! We always have my grandmother’s cornbread dressing on the side, and I always use Swanson’s chicken broth to moisten it. Down south (Florida) my family enjoys traditional dressing with oysters. To keep all the flavors wonderful we use Swanson’s vegetable broth served with turkey gravy! OMG…….mmm mmm good! We are lucky we go to the big family deal at 1 where cornbread dressing is served, and make our own big meal here that evening (mostly cuz we LOVE the leftovers and my gravy is way better 😉 ) and make our soft bread stuffing but the big debate was who got the corners, but now we make some stuffing rings we invented earlier this year. We are all about traditional stuffing and not in the bird! I don’t eat stuffing so it’s definitely on the side! I’m personally a fan of cornbread stuffing on the side, and I love to add dried fruit, especially cranberries and cherries, to it for a nice kick. One item I actually prefer to exclude is celery, which I’m not a fan of, but that is a source of debate here since everyone else likes the different textures in their stuffing. So I usually make half a batch with and half without the green stuff! The picture of that mushroom stuffing looks really tasty! If we are stuffing the bird, I like traditional stuffing. If it is going in a casserole dish, than I like cornbread stuffing. Bacon and mushrooms should always be in the stuffing but no nuts (hubby can’t have them). i prefer the traditional Pepperide Farm Stuffing. I cook it on the side and not in the bird. I’ve heard that cooking inside is not good. Never tried it before. I add in Bacon and lots of Chicken Broth. One year we made it with goat cheese and it was yummy.Not sure what to leave out of it I guess lots of veggies. My husband makes stuffing and its the best. He makes it in the turkey and does not use cornbread. Thanks for the giveaway…ours is the usual stuffing vs dressing debate, so we usually do both; we do a cornbread with spicy chorizo sausage & chiles stuffing/dressing to give the meal a bit of a kick ! I’ve always cooked our stuffing in the bird & added apples, onions, fresh herbs, cranberries & walnuts, tarragon, parsley– rarely, sausage. Never tried cornbread stuffing but don’t have an aversion to it. These days I’m inclined not to put the dressing in the bird- to allow it to cook faster & retain moisture. As long as you use good quality broth / stock such as Swanson’s, you’re good to go with flavor. Overall I like the texture better when the stuffing isn’t in the bird. We always ate our stuffing in a separate pan while growing up. We had a sausage and apple stuffing with the giblets/broth. I also like the Cornbread stuffing my mother-in-law makes. I like how the stuffing is crispy a bit on top and around the edges. I continue to make stuffing in a pan and not in the turkey.